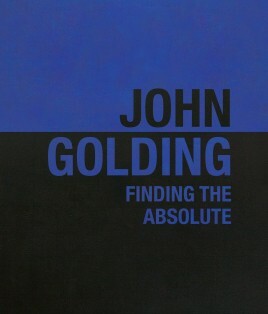 John Golding: Finding the Absolute, focusing on Golding’s abstract paintings from the 1960s, offers a unique opportunity to appreciate Golding at the outset of his lifelong pursuit to realize the ever-elusive promise of the absolute through abstraction. These works, most of which have not been seen for nearly half a century, are dynamic, youthful, brimming with the influences of the great exponents of abstraction – Mondrian, Malevich, Pollock, Newman – and palpably created through the artistic language of the 1960s, the decade of swinging Pop and artistic revolution. First published to accompany Piano Nobile's exhibition, John Golding: Finding the Absolute, which ran in conjunction with the Kings Place music program focusing on Minimalist music, curator and author Dr Charlotte de Mille addresses the overlaps between music and art in Golding's early works. John Golding’s paintings from the mid 1960s focus on questions of form, scale and materiality – the works grouped in this exhibition can be considered as repetitions on a theme as shapes recur in different colors and contexts. These aesthetic resonances with subtle differentiations orchestrate a rhythmic dynamism in composition, and across the space of the exhibition as a whole. Evident in the corresponding music program, Minimalist compositions originate from similar concerns with theme and variation, the processes and language of composing through subtle variation in repeated motifs, micro-tonalities, and almost hypnotic evocations of time and space. Golding’s paintings share the excitement of innovation and exploration of the mid 1960s born of a common historical context in which modes of expression were reinvented. Charlotte curates the music programme for The Courtauld Gallery, where she works for the education department.Charlotte curates the music programme for The Courtauld Gallery, where she works for the education department. With them she co-authored ‘Animating Art History’, a joint initiative with Central St Martin’s and the University of the Creative Arts, which was long-listed for a Clore Award in Museum Learning. Receiving her doctorate from The Courtauld Institute of Art in 2009, she has taught at The Courtauld Institute of Art, and the Universities of Sussex, Bristol, and St Andrews. She is editor of Music and Modernism (2011), co-editor with John Mullarkey of Bergson and the Art of Immanence (2013), and has contributed to Routledge’s Music and Visual Culture: A Research Guide, Modernist Games: Cézanne and The Cardplayers, Understanding Bergson, Understanding Modernism, Gothic and its Legacies, Creative Writing and Art History, and journals Art History and The Burlington Magazine. She is Honorary Research Associate at The University of Bristol.